In late fall, Harmattan steadily blows in thin layers of dust all over Ghana. As the Saharan winds mix with the heat, the result is a drying effect on soils and vegetation, even in the most verdant parts of the Volta Region. But in the region’s capital, Ho, rich plant life persists in spite of the seasonal downsides. The urban hub is surrounded by low valleys, dense forests and is adjacent to Mt. Afadzato, the highest peak in Ghana. It’s also where the regional Department of Parks and Gardens’ Botanical Garden is found. 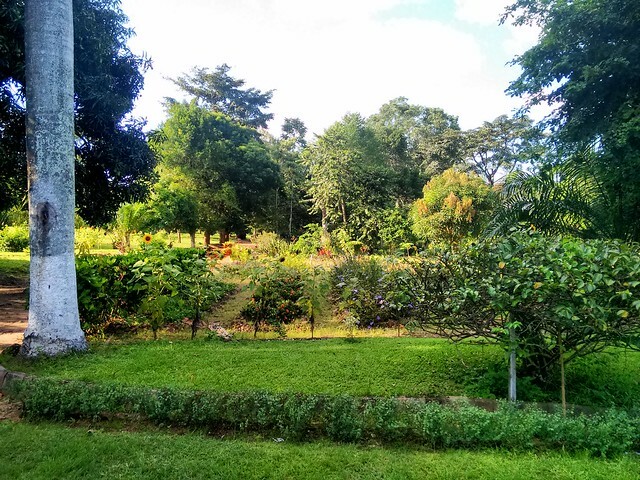 Despite boasting a number of significant wildlife and nature reserves that are heavily frequented by tourists, including the Kyabobo National Park and the Xavi Bird Watching Sanctuary, public recreation spaces for local Voltarians are few. In this city where density continues to rise and the majority of the population is young, the caretakers of Ho’s single botanical garden hope that for now, local community members find within it, a space for recreation. When you arrive at it, there aren’t any guidebooks or maps laid out to orient you to the space. Rather, you’re encouraged to ask as many questions you can think of on a guided tour – similar to the one I took with Sackey-Addoo. But as we walk, Sackey-Addoo points to a major user group that isn’t utilizing the garden as much as he would like to see: kids. “We [want it to] be a playground for children, for you to come with your family and even relax over here. This place is attractive enough but we need to make it livelier.” With the Volta being one of the fastest growing regions in Ghana, perhaps that’s not a long shot. 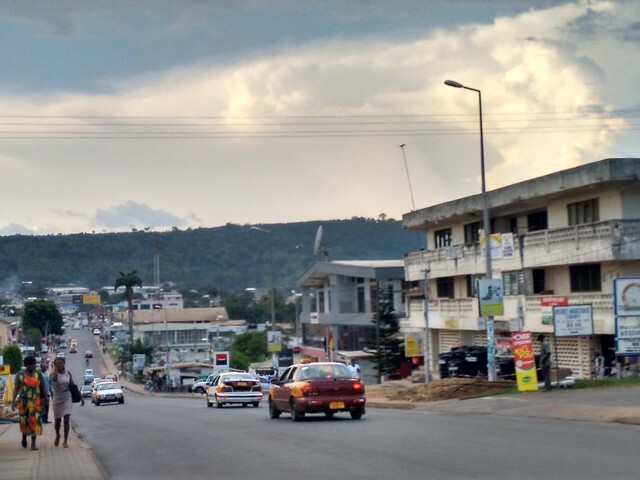 The population in the Volta has more than doubled over the last 50 years and Ho Municipal is the largest district. The recent completion of the University of Health and Allied Sciences in 2015 and additional teacher-training programs continue to draw more people to the area. Along with these assets and a population close to 271, 881, Ho’s Department of Parks and Garden’s regional director Bright Adenyo recognizes the city’s pull. “Volta Region is a unique place to be [in],” Adenyo shares with me as we sit in his office at the regional headquarters, located next to the botanical garden. “And Ho attracts a lot of people, both indigenous and foreigners. [Because we] share boundaries with Togo, there is a lot of movement within. Also trained in horticulture, Adenyo describes his current role as supervising a number of other surrounding districts to ensure that they are effectively maintaining their park and garden spaces. But since his posting to Ho last year, he’s been tackling the issue of creating recreational space for Voltarians in light of the new labor force and residents that are entering the region. Adenyo says students from nearby schools are encouraged to visit the garden on class excursions at no cost. To him, this critical point of contact can be leveraged. “If you have a space [like this garden], where they can learn something, then they can come anytime they wish.” He is intent on expanding and redesigning the botanical garden and is seeking innovative ways to fund the hiring of more staff and additional equipment. The botanical garden is an essential building block for serving the recreational needs of the community now and in the future. 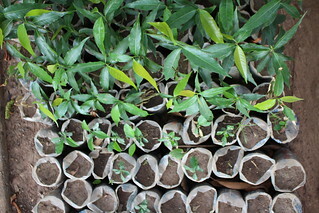 Inside, a plant nursery peeks out from behind a giant ficus tree, where ready-to-purchase seedlings are maintained under shade. 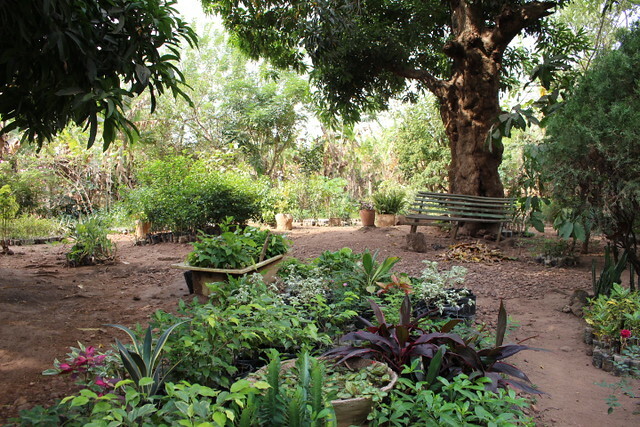 Staff members work nearby, prepared to share information about the garden’s plant life that hails mainly from South Africa and local Accra nurseries, to novices or seasoned gardeners seeking landscaping resources. More investment in this garden to ensure that it stays in the best condition for all visitors is vital, but it won’t be an easy feat. 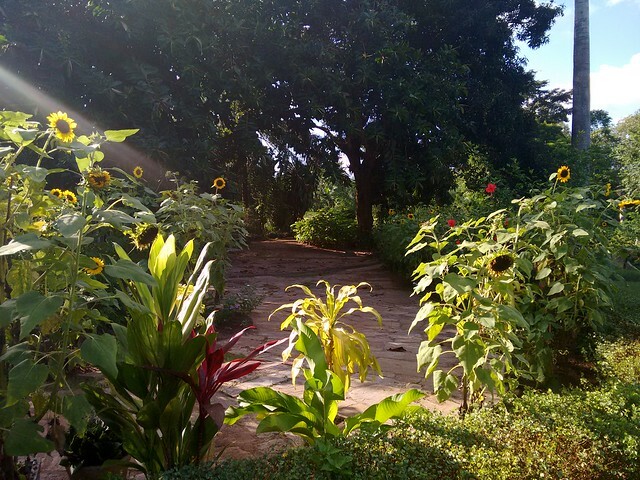 Initially describing the garden’s divisions and plant species at the start of the tour, Sackey-Addoo quickly addressed the dry seasons’ visible effects on the vegetation. He then pointed towards a single water source in the center of its entrance and later mentioned two additional pipes, all used sparingly. Dependence on rainfall that arrives in March is the most cost-effective watering option for the botanical garden’s lawn and ornamental flowers. Otherwise, the gardens’ water usage can run the bill into the millions of cedi’s during Harmattan. Still, the garden has character as plant life in some parts wither, and in others, holds steadfast. All of this— the services the department staff provides and the garden’s function as both a space for larger group gatherings and a respite for just one person— adds value to the area and community as a whole. “Coming to Ho, I’ve gained a lot of experience,” Sackey-Addoo tells me at the end of the tour. 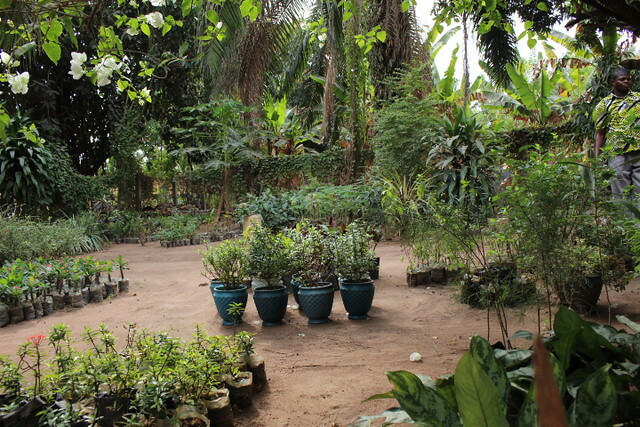 “[This place] has opened my eyes to most of the plants I never knew about, because every year, new plants come into the system.” Having studied at the School of Horticulture in Aburi, Sackey-Addoo remains eager to engage the community’s younger population on topics of the science’s four branches, the plants with medicinal properties, and better overall gardening practices. “We expect students to come here to learn [this] because we deal with botany, with natural living things. This place should serve them a lot of purposes, for health, recreation, and education.” He’s convinced that with increased government funding and renewed interest from the community, the botanical garden’s value can be sustained for the next generation. Post and photos by Adjoa Akofio-Sowah. She is a Ghanaian-American, Minneapolis-native, an independent writer with a primary focus on ecologically-based landscape design of public space, currently living in Ghana. She is the creator of the IYE Project. You can learn about the project on Twitter @IYEProject. Thanks for posting. I guess I once saw saw this place from afar while on on a taxi. I will go there next time I am in Ho. Do most of us care about such green spaces? I ask this question because most of our newly build communities are stack concrete with no green life.If green spaces are provided, they are not maintained. We are missing beauty and serenity of nature in our lives. Adjoa Akofio Sowah, reI am happy you are bringing to attention ecologically based design of public place. Thanks so much for reading this piece, and for your comment on it. I hope you’ll be able to take some time and visit the garden and meet the staff. I learned a great deal by orienting myself with the area, the department and its function. Support of these spaces is critical and finding ways to offer it is what may help strengthen their mission and capacity to be more and do more.